Mayor Martyn Evans and some of the award recipients. 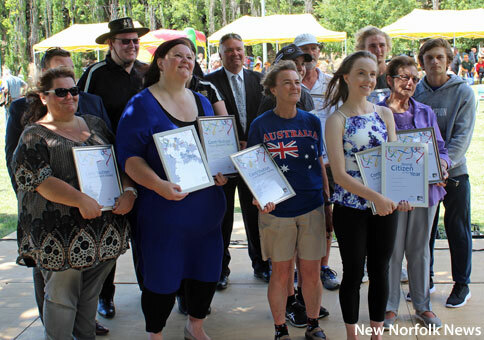 THE sun shone on this year's Australia Day observance on the Esplanade at New Norfolk earlier today. A slightly larger than usual crowd was in attendance, perhaps attracted by an unofficial raft race on the river. The annual fun run and walk was organised by the Tasmanian Road Runners for the first time, with separate events for adults and children. Alec Humphrey and Gabby Wilson were the first man and woman across the line in the senior event, while Charlotte Williams and Max Murray were the fastest girl and boy. Musical entertainment was once again provided by the Derwent Valley Concert Band and Derwent Valley Community Choir, along with a performance by long-established local group The Sign. The Lions Club was on hand cooking a free sausage sizzle as usual and displays and activities were presented by groups including the New Norfolk Fire Brigade, Salvation Army and Tree2Sea. An address was given by two-time Olympian Dana Faletic who also received a presentation from Councillor Julie Triffett in acknowledgement of her service as an Australia Day Ambassador. Master of ceremonies Craig Farrell MLC said Ms Faletic needed little introduction as she had grown up in New Norfolk and her career had been closely followed by the Derwent Valley Gazette over many years. Certificates acknowledging contributions to the Derwent Valley were awarded to: Terri Sweet, Geoffrey Williams, Lexia Brown, Madison Shaw, Emma Browning, New Norfolk Rowing Club Under 21 men, New Norfolk Can Hope Cancer Support Group, Lions Club of New Norfolk, Magra Fire Brigade and the Derwent Valley Concert Band. Check back later for profiles and photos of the award recipients.